If I asked you to associate Fine Arts with one word, I am pretty confident the answer would, unequivocally, be drawing or sketching, writes Maria Christoforou. Now, I am curious to see which word you would use to relate the subject of English to the specifics of a course of Fine Arts. That is an even greater challenge! I came across the call of designing English for Fine Arts this year and I must admit, I, initially, dreaded it since flooding ideas of drawing or sketching prevailed in mind as well. But, I did feel it was up to me to refute that perennial and infuse the English course with a plurality of technological tools to make it more entertaining and engaging. 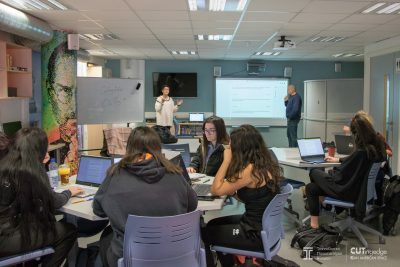 It is not an easy feat for students of Greek as L1 to accommodate topics such as Art Movements, Drama and Theatre and New Media Art in English (L2), and to let go of their precious drawing pencils; let alone manipulate all sorts of technological devices. In fact, students were not aware of English for Specific Purposes (ESP). Their expectations revolved around rigid grammar rules and instruction-based listening exercises. The first English lesson with my Fine Arts students resembled a theatre play. It started off with humour –me, trying to convince them of the necessity of bringing their laptops in class. In the middle of the lesson, high doses of perplexity were infused –them, being unable to process why they would need their laptops in the first place. Finally, the lesson reached its peak with a tumult of shouting – them, refusing to abandon their pencils to the scourge of the English course and its technological nature. I came to realize that, despite their devout adhesion to their smart phones, tablets and social media profiles, most of the students do not conform to technology for educational purposes very well. It may come as a surprise but, when asked if they had ever accessed Google Drive from their Gmail account, my students gave me a vague look as if I had just landed from Mars. Truth be told, Google Drive initially had given me a hard time a few years back; it was not love at first sight. Gradually, it evolved into deep love, though. One of the perks of this tool, for students and teachers alike, is the stress-free attitude towards losing your USB. So, I made a rigorous abandonment of the Course book and, selectively, borrowed articles from it, which, of course, I uploaded on Google Drive, week by week, session by session. Students, on the other hand, were guided through the creation of their own folders, something which conveniently dissolved all the “I lost my assignment”, “I had it on USB but now it’s gone” excuses. It was a blessing that students could access Google Drive from their smart phones too, ensuring constant connectivity and engagement to the course. However, the price to pay for its practical implementation was the endless and time-consuming questions during and, especially, after the course as to how to save a document, how to retrieve it and, especially, how to share it with the instructor. It wasn’t until mid-semester that issues with Google Drive were handled. Employing YouTube for listening actually increased the effectiveness of learning vocabulary through a context and of speaking (and pronunciation) practice. Students watched Art Movements such as Impressionism and Pop Art come to life in a single video that could embody pictures, examples, definitions and the opinions of experts; that alone, helped them become more aware of their learning through a specific context. With YouTube, the students were able to understand concepts like Pop Art better, instead of solely reading about them in repeated, isolated book exercises. Not to mention the ubiquitous nature of Facebook. There is no other tool that can establish student-commitment and prolong learning, even after the termination of the lesson. The creation of a Facebook closed group for our course committed my students to using course-related terms continuously and contributing ideas on a variety of topics such as places of internship, art exhibitions and so on. 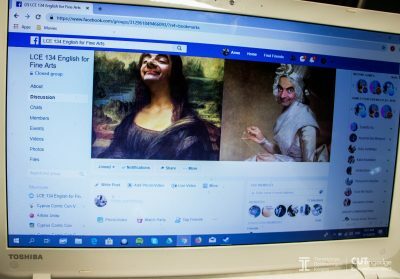 The integration of Facebook in this course has, indubitably, enhanced the learning effectiveness of students. An attractive e-portfolio is a pertinent aspect of the Fine Arts program of study and also a prerequisite for future employers. The latter are more likely to resort to that rather than the student’s CV, maybe because there is no better representation of the student’s work and ability than the digital one. Through the needs analysis I had conducted prior to designing the course, I felt compelled to introduce my students to various social media sites such as Weebly, WordPress, and Wix. Yes, it is virtual but it is still reality and it is here to stay. Why solely depend on verbal talks about museums when we can enhance lesson efficacy within a virtual context? I must admit that we’ve come a long way since September: from the absolute antipathy for technology, my students will now teleport and navigate through the Dali Museum and immerse in a more meaningful representation of Surrealism. 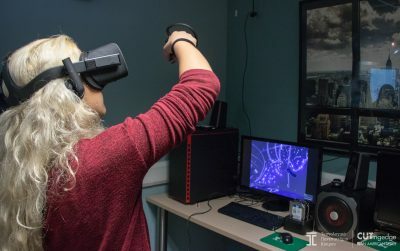 Frustration that may come with the familiarization of the VR hardware and software could offer limitations, not to mention the Oculus VR equipment which cannot be transported outside a lab. 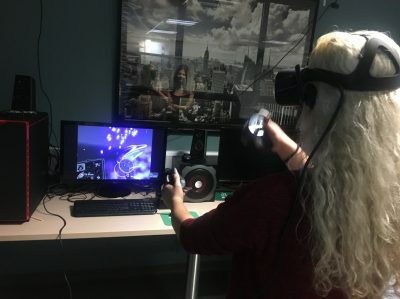 Research has shown that incorporating Virtual Reality into Language Learning augments learner motivation and provides a greater incentive for learning. 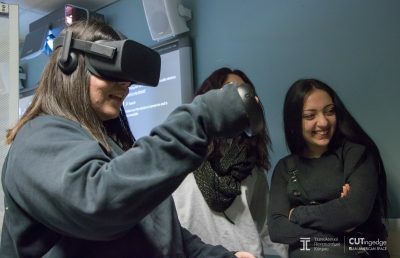 For this reason, I have integrated the VR application Tilt Brush within the curriculum for English. 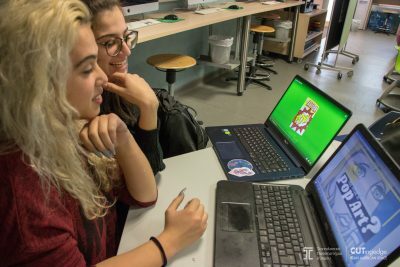 Through this application, they will be enabled to unleash their creativity while painting in 3D space and using L2 for describing the process of their experience. You must remember that we are talking about students who are totally infatuated with painting so, through this application, I am making sure that fire is kept kindled. They, P., & Some, P. (2009). Principles of ESP course design, 1–7. Maria has been involved in ELT since 2002. She has worked as a Teacher of English as a Second Language (L2) in private institutions, as a Teacher in a private school teaching English as a First Language (L1), a Speaking Assessor for English exams, and as an English Language Lecturer in Tertiary Education Institutions in the private sector in Cyprus. Her postgraduate qualifications include a Masters Degree in Professional Development in Education from the Open University, UK. 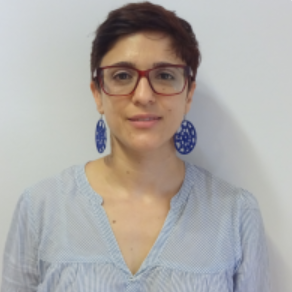 She has been involved in Curriculum Development and Teaching of English for Specific Academic Purposes (ESAP) at the Cyprus University of Technology since 2012 and has also taught English for Academic Purposes (EAP). She has designed the Curriculum for various ESP courses such as English for Management, English for Multimedia and Graphic Design, English for Chemical Engineering and English for Fine Arts at the Cyprus University of Technology. She is, currently, working on her PhD proposal on the adoption of Virtual Reality applications in teaching and integration of emergent innovative practice among teachers and learners. When she is not testing VR applications, she enjoys running as she is a proud Half Marathon runner.